If you’re looking for a free Quickbooks alternative that makes accounting simple and delightful — all while helping your business grow — you’ve come to the right place. 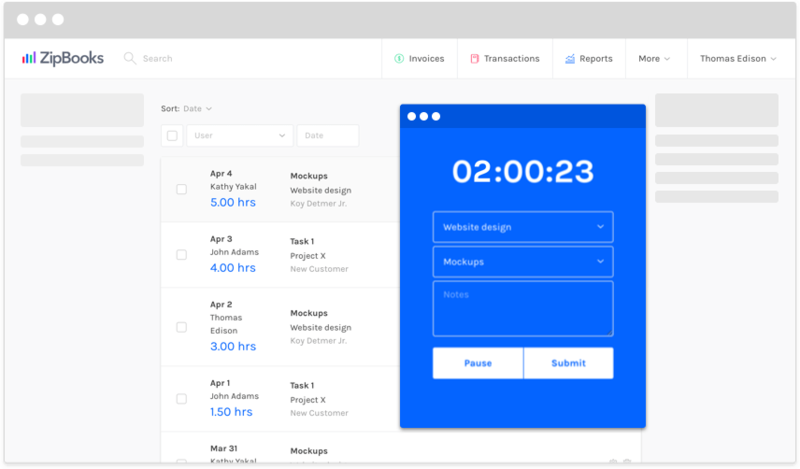 Send professional invoices in seconds and get paid seamlessly through ZipBooks, Stripe, PayPal, or Square. Simplify billing with set-and-forget recurring invoices and automated payment reminders. 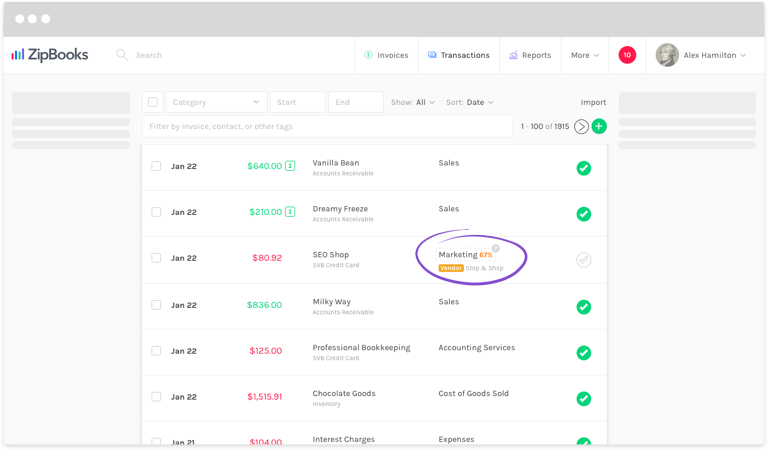 Bookkeeping and reporting are smarter in ZipBooks, with automatic bank syncing, dead-simple reconciliation, and artificial intelligence that categorizes transactions for you. See instantly and more simply than in Quickbooks exactly where your business is at. Our fast-loading and color-coded reports are comprehensive yet streamlined and easy to quickly understand. ZipBooks can automatically send text or email review invites to your best customers after you get paid. Let us sync all of your online listings and watch your local search rankings skyrocket. Try that in Quickbooks! ? 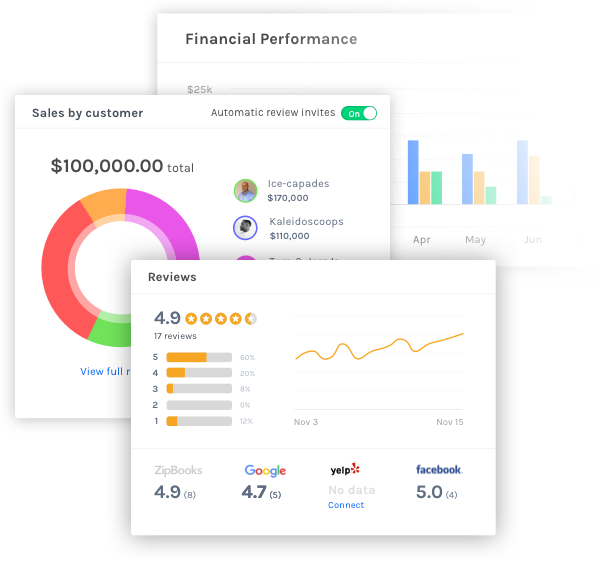 ZipBooks is a modern, feature-rich alternative to Quickbooks that gives you all the classic accounting features you need plus automated customer engagement features to help you grow your business. How is ZipBooks different than Quickbooks? ZipBooks was formed with small business owners in mind, not just accountants. Because of that vision, we think ZipBooks offers a more streamlined interface, more intuitive reporting, and more visually appealing workflows. In short, it's simple to use -- and though it's capable of doing accounting for high-revenue businesses, the heavy lifting stays behind the scenes. Do I download or install anything? Nope. ZipBooks is 100% "in the cloud." That means you can log on any time, from any device, and all of your data stays in sync no matter what. All you need to do is sign up, and ZipBooks will be ready to go to work for you! If you're interested in desktop software, see our review of Quickbooks 2019 desktop products. Will my bookkeeper or CPA work with ZipBooks? Tons of bookkeepers and accountants work inside ZipBooks every day. We think it will be a great experience for them, and ZipBooks makes it easy to control permissions and share files. We also offer a bookkeeping service for those who don't have a bookkeeper they're already working with and don't want to do the bookkeeping themselves. Does ZipBooks do double-entry ("real") accounting? Absolutely. 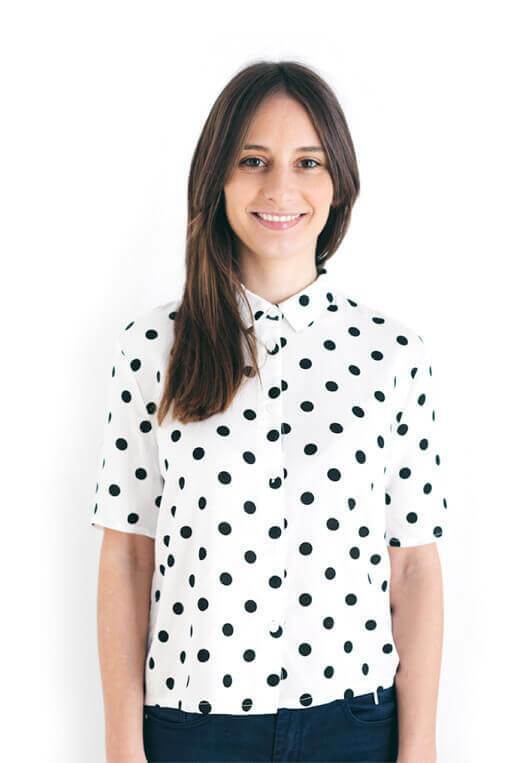 A large part of our product team is made up of former accountants, and they wouldn't have it any other way! While we've made ZipBooks easy to use for even the smallest businesses, it's built on an architecture of sound, time-tested accounting principles. We've tried really hard to cater to all small businesses with our pricing plans. We have a totally free plan that is widely used by businesses that are just getting started or are side hustles. That means invoicing, accounting, contact management, review gathering and publishing, and simple reports are all completely free. More advanced features that would be used primarily businesses taking the next step in their growth are on our paid accounting and growth plans. See pricing here. I've been in Quickbooks for a long time. Is ZipBooks hard to learn? Not at all. In contrast to the certifications offered just for learning Quickbooks, making everything intuitive enough to use without training is a central part of our product development. In part because we offer a bookkeeping service on top of ZipBooks, driving simplicity and ease-of-use is core to who we are. What kind of support does ZipBooks offer? For our software users, we have in-app chat support with our super helpful and friendly customer success team. You can also get help and advice in our Help center. Customers that sign up for our professional bookkeeping services have access to their bookkeepers via phone as well. What about the other Quickbooks alternatives out there? We invite you to try ZipBooks for free and see for yourself why it's better! We're confident you'll find it's more intuitive, easier to use, easier on the eyes, and more feature-packed than the alternatives. Want us to take everything off your hands? If you're migrating from Quickbooks, it may be the right time to consider having someone do your books for you. Our friendly, experienced bookkeepers can do it -- probably for far less than you expect! ZipBooks bookkeepers will get you accurate, monthly financial reports including an income statement and balance sheet so you can be ready for quarterly or monthly taxes. For those who also need tax prep help, ZipBooks also works with reliable, prompt tax partners who can take care of state and federal taxes regardless of your entity type. Unlike rules-based systems like Quickbooks and other alternatives, ZipBooks uses artificial intelligence to categorize transactions. That means it gets smarter and smarter as more transactions are categorized, leaving you or your account with less and less to do. Like Quickbooks, ZipBooks allows for bank reconciliation -- but we've made it much simpler. 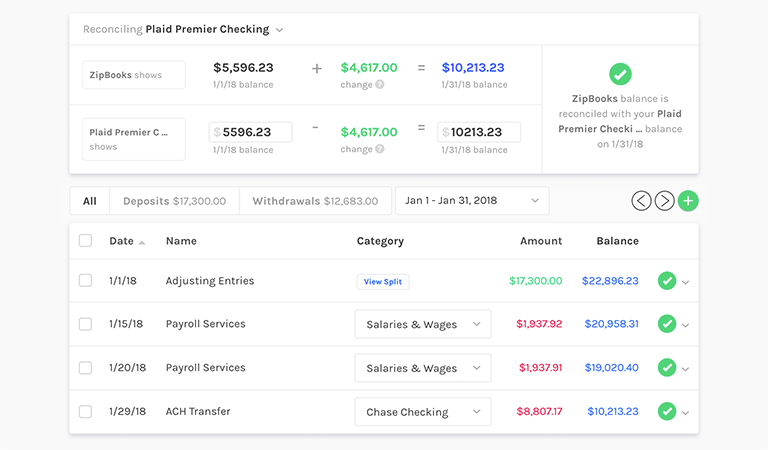 Allowing simple entry of starting and ending balances and showing you the balance formula allows you to instantly see what needs to be done to reconcile. Our time tracking component lets you start time on one device and end it on another, seamlessly. Watch team members log time, live. When you're ready, pull time into invoices to be billed. 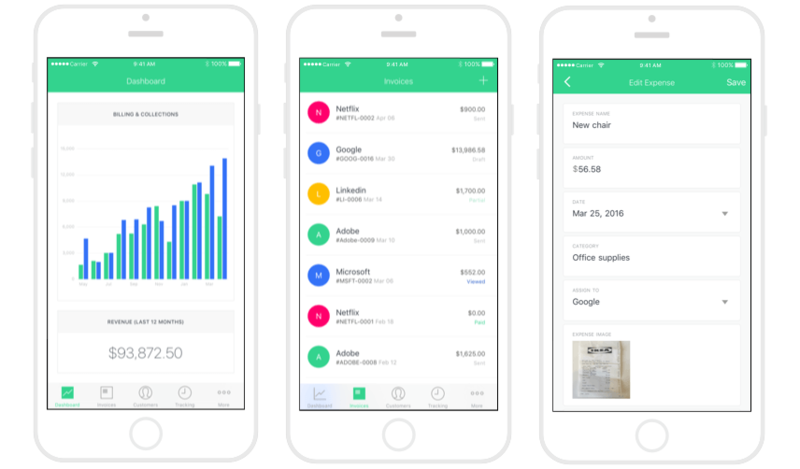 Our native app and mobile-optimized web app make accounting on the go easy. In Quickbooks, you pay extra "class tracking." In ZipBooks, you use smart tagging to apply a vendor, customer, location, business unit, or anything else to a transaction -- then run instantaneous reports based on any tag combination. When we founded ZipBooks, we strongly believed that small businesses deserved better than what was out there. We’d been there as small business owners: bouncing around multiple accounting apps, using one, then the other, trying to balance all of the varying needs we had. ZipBooks was born to bring small business owners into one place that could handle all of their accounting — and since then, has grown into so much more. What we’ve realized is that small business owners don’t just need to track revenue, they need to grow revenue. So we’ve built our product to meet that need: in addition to full-featured accounting, we allow businesses to track online reviews and send automated text review invites for Google, Yelp, and Facebook. We manage and sync your business listings across the web, and let you track your rankings on the searches that your potential customers are making. All of that in one beautiful, seamless package. Quickbooks was (and is) the 800 pound gorilla in the accounting software space. We’re raising our hands to say that’s not good enough anymore. We’re digging into what small business owners truly need to succeed in their businesses, because we’ve been there, too. We’ll keep at it, because we know you are.